Well, someone tried stuffingyovanny pepper? Tried it, if not all, almost all. He wins the hearts of many lovers. This stuffed pepper recipe is very simple, but insanely delicious, in addition, the ingredients are familiar and loved by all. Rinse the rice thoroughly in water 5-7 times, Pat dry and place in a saucepan. Rice pour two cups of water, salt and boil until tender. Will peel the onion, rinse it, slice finely. Carrots also clean, wash and grate on a fine grater. Carrots and onions mix together. In a pan pour vegetable oil, put vegetables and fry until Golden brown onions. Mix together the rice, raw ground beef and roasted vegetables earlier. The resulting stuffing stuffed peppers season with salt and pepper, stir. By the way, in the filling you can add other spices, such as herbes de Provence. Wash the bell pepper in water, with each cut off the top, remove the seeds. Empty the peppers firmly apply the filling, close them with the tops. Wash the tomatoes, dry and cut them in half rings or rings. Put the tomatoes in the pan, pour broth, add salt, pepper and put on fire, heat, close the lid and simmer for 3-5 minutes over medium heat. In a deep baking dish tightly put the peppers, fill them with broth and tomatoes. The form put in a preheated 180-200 degree oven for 30 minutes. Sometimes water the peppers with the broth. 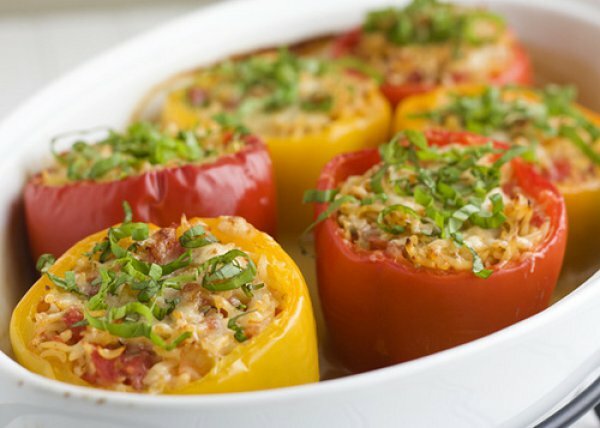 As you can see, the recipe of the stuffed peppers simple dish turns out delicious and hearty. Put it on plates and serve. To cook rice you need with the lid closed in a non-stick container, without disturbing. And pepper you can add green, so it will be more fragrant.